And while it may be true that each generation of teenagers invents the entire world from scratch (just ask them! ), we’re not talking here about text messages and Twitter, despite the similarities. No; a thousand years ago teenagers in the Japanese Court were doing the same thing as their modern counterparts—sending secret messages back and forth—limited then by formal poetic structure instead of digital character count. These messages, though, were being sent under markedly different conditions than those faced by modern-day texting teens: traditional court etiquette made it difficult for a teenage boy to even properly see a girl who wasn’t in his family, forget about holding a conversation. And if the wrong boy was caught talking to the wrong girl, they weren’t simply sent to their rooms, didn’t just get their phones taken away for a month—they were exiled far away, sent to live a life of poverty, coldness, and isolation. 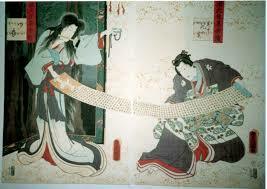 The form was famously immortalized in Murasaki Shikibu’s The Tale of Genji, a classic text considered by some to be the first-ever novel.The book follows the life and loves of the title character from his boyhood to his death (and beyond, actually—the English translation is 1000-plus pages long and goes deep into the romantic history of his sons, too), and is loaded with Waka that are both opulent and emotional. 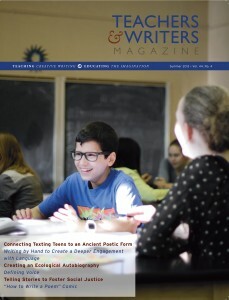 It also makes a perfect lesson for middle and high school students today, connecting them to the history of poetry via a structure and a type of secrecy that are immediately familiar to them from the late-night texting barrages that swell their parents’ cellphone bills each month. Click here to read the rest of the essay.